Yesterday was Metallica Night at the San Francisco Giants-Los Angeles Dodgers game. James Hetfield and Kirk Hammett were on hand to perform The Star-Spangled Banner, while Lars Ulrich threw out the ceremonial first pitch. 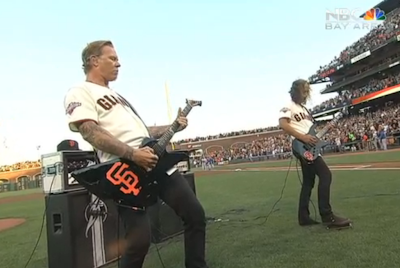 Check out footage of the festivities below, including a pre-game interview with Hetfield and Robert Trujillo, along with footage of a jam session the band had with Giants pitcher Barry Zito.